At the Contemporary Arts Forum, Friday, April 25. Robert Black is a solo double-bass virtuoso who specializes in the unexpected. When Robert Black, dressed in black himself, raises his fist to his bass in his composition “Swoosh” (2005), the bass knows he doesn’t mean it. It’s a French bass from about 1900, with a light color and sensuous curves, and clearly they’re having a lovers’ quarrel that will end in an embrace. This work, part of Black’s recital of contemporary, experimental music for the instrument, is entirely silent-the dialogue between performer and instrument happens in the imagination. When the next piece comes and the sound starts again, everything sounds richer and clearer. Black’s recital represents a new and interesting direction for the instrument. 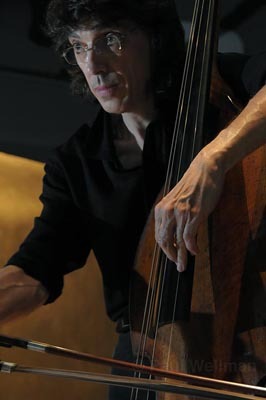 Instead of turning the bass into a sort of solo cello/viola by playing almost exclusively in its highest register (as Gary Karr, Ludwig Streicher, and other virtuosos of the past have done), Black explores the sounds the instrument makes more naturally, adding depth and interest to its low voice through clever harmonics, percussive sounds, and every other trick he can find. These sounds are extraordinarily expressive, yet also relaxed and contemplative. Evan Ziporyn’s “Hval” (2006), for instance, leans heavily on the composer’s background writing for the Balinese Gamelan, using one of the open strings as a drone, with stopped notes and harmonics weaving back and forth above it. The result is a wave-like rhythm juxtaposed with whale song, all above a deep-throated rumbling that suggests a whale’s enormous size. “Beast” (1971) by James Tenney also uses a deep open string, but in the service of a kind of minimalism even Philip Glass would find arid. The open string sounds in unison with a fingered note on another string-then Black moves it a microtone out of tune, first sharp, then flat, then sharper and flatter. The overtones of the note create their own pulsating rhythm against the steady sounding of the open string, creating a mysterious world of echoes and illusions. Black wound up the evening with a pair of microtonal works: Giacinto Scelsi’s “Mantram”-an undated work that might have been the eccentric count’s last-and Peter Velikonja’s “Uncle” (1982). “Mantram,” surprisingly, sounded almost conventional in this context, with clever melodies and echoes of Berg and Cage. “Uncle,” on the other hand, led us through a maze of sound, as the ringing chime of harmonics alternated with the clang of unstopped strings. Afterward, Black answered questions from the audience, cheerfully and accessibly, making perfect sense, yet entirely brilliant and original, like the recital he had just performed.